nUView Precast Gels | Tamar Laboratory Supplies LTD.
By developing a proprietary new buffer system, nUView Precast Gels (NuSep Australia), has been able to create a gel that has amazing shelf life. The nUView Precast Gels have been designed specifically to provide you with at least 12 month shelf life and so you have greater flexibility and control over your laboratory resources. Gel hydrolysis is minimised by changing the chemical composition of the gel and by the use of a Tris-HEPES running buffer. The end result very stable and reproducible precast gel. nUView Precast Gels offers the new generation of precast gels to help you achieve the best results in a cost effective way. The beauty of nUView is that you can visualise your proteins within 2 minutes of completing a run and this visualisation does not change or interfere with any other downstream process. Using NUView you can photograph your gel post the gel run to create a permanent record. After this visualisation you can blot, probe or stain in the full knowledge of your samples location and concentration. 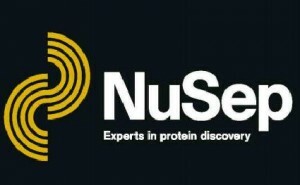 The nUView Precast Gels technology is a breakthrough in protein separations. Bio-Rad Mini-PROTEAN™ II & 3, Novex XCell I and II™ and Surelock™, Hoefer Mighty Small™ II (SE 260/SE 250), Hoefer Mini VE, Hoefer Tall Mighty Small™ (SE 280), Owl Road Runner (Penguin), EC 4- Cell, Owl Single Sided Vertical System, Daiichi Mini 2-Gel & 6-Gel, Gradipore Mini 4 Cell and more. 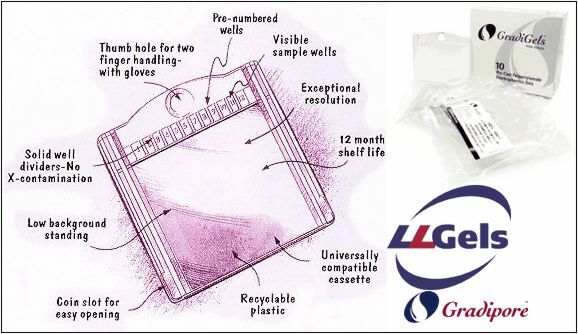 Hassle-free cassettes: LongLife Gels™ are made in Gradipore’s patented cassette. Because it has no combs or tape to remove, this cassette makes our precast gels the fastest to set up of any gel on the market.